Are you a Ranch dressing lover? Me too! We often have customers ask us for an alternative to Ranch dressing, and here it is. Try this as a dressing on a salad, dip for chips and all your vegetables like cucumber, carrots, broccoli, and a sauce for potatoes, chicken or whitefish. Natalie Jaeger knew it wouldn’t be easy to land a new job when her husband was transferred to St. Paul from Chicago last year. Jaeger had been managing the conversion of old buildings to condominiums in downtown Chicago. Because the real estate market had soured, she decided to play off her love of cooking and tried to get a sales job with a food distributor. With no prior food business experience, her attempts fizzled. Light & healthy salad that packs the flavor! The Tuscan Herb olive oil and Sicilian Lemon Balsamic vinegar take this salad to a new level! Article by the Crystal Grobe, WCCO CBS. Updated: 5/25/2010. 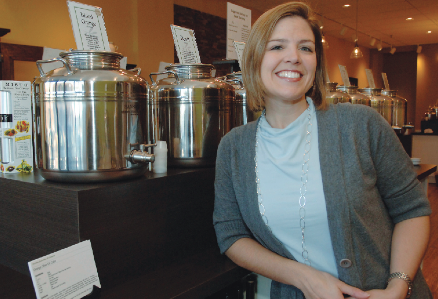 Tucked away in a cute shopping center in Mendota Heights is The Olive Grove, owned by Chicago transplant, Natalie Jaeger. The Olive Grove opened in October of last year, providing us food lovers with a reason to stock up on vinegars and olive oils.